If the game boots and the graphics are ok but it crashes in game maybe it's related to encryption/decryption Machine commands?? kf2k2mp2_px_decrypt(machine()); did you add a encryption/decryption scheme for this define to the neocrypt.c machine file ?? I just took the topic ever created for not even having to open another. Yes, but is not used by kof2k2c2 and the hacks that I'm trying to add, I thought I needed but did not, because all the roms are decrypted, the reason I say this is that in Kawaks, if not decrypted, does not work properly. If all the roms are already decrypted, the driver_init will be 'neogeo'. But if some need decrypting, which ones are they? I don't have the sets you're talking about, but I just added kof2k2mp3 (Magic Plus III) to my emu, all the roms are decrypted and it appears to work fine. I found some sets though that start ok, but crash while the demo fight is going. These are buggy imo. You might have one that contains bugs. I notice that Kawaks and others have different address alignments to MAME, so a game that works fine in Kawaks can cause a 68000 exception in MAME. I had that problem the other day when I added the demo 'knackiballs'. Being a simple demo I was able to patch it to make it work. However if that is the problem, you are unlikely to be able to patch such a large game as kof2002. As for the other matter, we should use the PM system. Answered your PM. I'll be away for a few days on a short holiday. I added kof2k2js to HBMAME and it worked. I'm no gamer so cannot comment on a particular move. Perhaps it still crashes where you said, but I have no way to get to that point. All I can do is make sure it looks ok in attract mode. I did notice that the set is almost identical to kof2k2rm13, so perhaps you could try that one instead. EDIT: Looking at your screenshots I can see it complaining about address misalignment. It says A6=C9A2C9A5 which is an odd number. You can only write to even addresses (unless in byte mode). That's why it has stopped. Kawaks and some others will let you break the rules, which is why the game works on them. 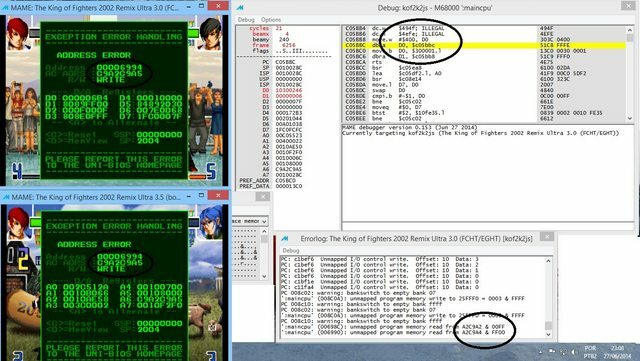 It is unfortunate that so many neogeo hackers use KawaksPlus and other hacked emulators for their development. this kof2k2rm13 is part of HBMAME? My hope was that this build of MAME (HBMAME) the game did not have the same error, but it does. kof2k2rm13 is also known as kf2k2rm13 and you should have no difficulty finding it. The source even says where. I have no idea what an Iori DM move is.. anyway it appears the hacker made sure it only works in Kawaks.